The Quincy, Illinois City Council has approved the purchase of 500 new children's bike helmets which will be distributed to local school children throughout Quincy and Adams County this spring. The helmets will be given out free of charge through a coalition between the Adams County Health Department and "Safe Kids Adams County." The goal of the free helmet program is to make sure that all children who want to ride their bikes to school are able to do so safely. By providing these helmets, local officials hope to bring awareness to bike safety and to encourage children to ride their bicycles as a health activity. The town received funding to purchase the helmets through a grant from the Illinois Safe Routes to School Program (SRTS). 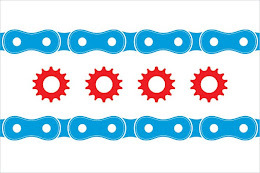 The Illinois SRTS Program is part of the national Safe Routes campaign and is run within the state by the Illinois Department of Transportation. The Safe Routes program was started to address the dramatic decline in the number of students walking and biking to school and the resulting poor health effects. According to the Illinois SRTS Program, in 2001 only 16% of children walked or bike to school. This is down from over 42% in 1969. At the same time there has been this massive decline in the number of kids walking and biking to school the rates of childhood obesity and diabetes have skyrocketed. The Illinois SRTS Program funds local projects that improve students' walking and bicycling environments. Past projects have included the construction of new sidewalks, creation of on-road designated bicycling lanes, and the installation of more crosswalks. The Illinois SRTS Program is an important tool in making bicycling more accessible to children. By teaching children how to ride safely the program will hopefully help to decrease the number of children who are injured while riding their bikes. Keating Law Offices recently obtained one of the largest reported settlements in western Illinois on behalf of a bicyclist who was injured while riding in Quincy. Our firm represents injured bicyclists both throughout the entire state of Illinois as well as working with co-counsel on cases across the county.